The „1st Smart Islands Forum”, a specialized conference on sustainability, aims to encourage the exchange of experiences between island representatives and to offer a forum for discussion. The conference is expected to host over 40 island experts from 13 different European countries. 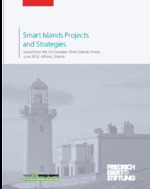 A „Smart Island“ can be described as an island that creates local sustainable growth, offering a high quality of life to the local people, protecting natural resources and equipping public power supply and transport systems with smarter technology, as well as applying innovative governance methods or exploiting new funding schemes that are more innovative and participatory. The 1st Smart Islands Forum is a first-of-its-kind networking event offering participants the opportunity to showcase different projects that demonstrate islands’ potential to host innovative technologies and implement eco-friendly, cost-effective policies in key sector, such as renewable energy and energy efficiency, low-carbon transport and mobility, waste and water management, sustainable and yearlong tourism and sustainable agriculture are some of these key sectors.